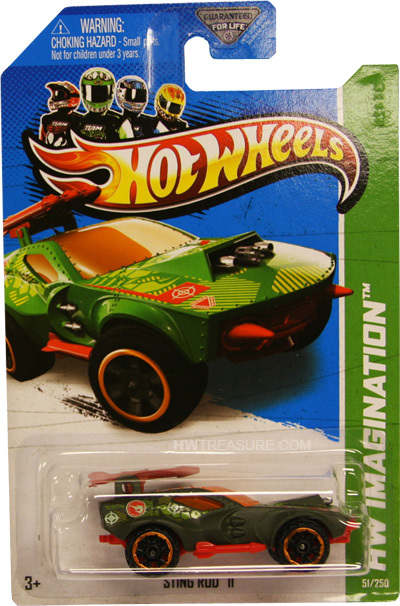 51/250 is part of the HW Imagination series and the 2013 Treasure Hunt set. The olive green Sting Rod features yellow, red & white graphics on the sides and hood plus the low production symbol on the sides. It has orange tinted windows, a grey interior, black Off-Road 6-spoke wheels with orange chrome rims, and a red plastic Malaysia base. 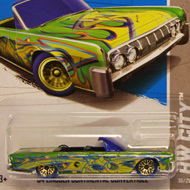 The car first appeared in the 2010 New Models series. 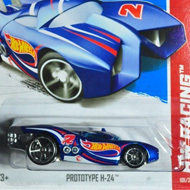 It is based upon the original Sting Rod, but has a sleek and futuristic design.